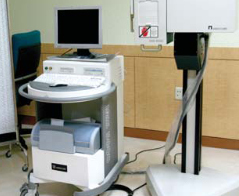 The latest equipment which can deliver the three-dimensional intensity modulated rotational radiation treatment. 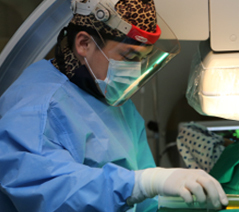 Dramatically reduced the treatment time within 2~10 minutes which including the 3D imaging. 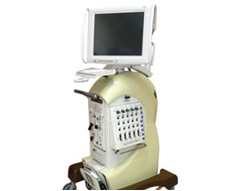 Supplying Agility which has the highest resolution in MLC of the general radiation treatment to the date. Agility MLC System can deliver the more accurate and advanced treatment plane and treatment, because it uses the 160 blocks which is just 5mm sized at the overall treatment area. The existing radiation equipment has about 2~4% of block leakage, but Elekta Infinity with Agility has only 0.5% leakage to minimize the radiation damage occurring in normal tissues. Chemotherapy kills cancer cells but normal cells are being killed, too! 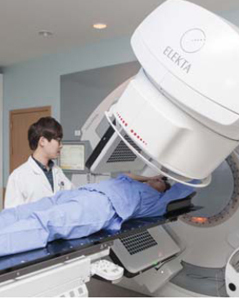 [The first in Korea] ET : Endovascular TreatmentA chemotherapy has strong toxic to kill enough of the normal cells. As normal cells are destroyed by intravenous infusion, immune functions are weakened. However, if a chemotherapy is performed to arteries that supply the cancer cells, it can be an effective attack reducing damage to normal cells. This procedure has been proven safe through adequate clinical experiments of more than 17,000 cases for last 20 years by Clinica E.T. Hospital in Japan. ET can be used with only 1/5 - 1/10 anti-cancer medicines compared to intravenous chemotherapy. It can reduce the side effects as 1/10 compare to intravenous chemotherapy. 80~90% of drugs are absorbed to cancer tissues rather than normal tissues. It attacks only the cancer cells without impairing the immune system. Diagnosis of cancer in the whole body with just one test! 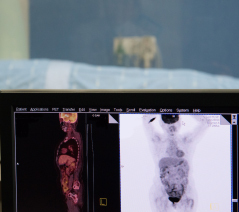 PET-CT Positron Emission TomographyPET-CT is an examination to scan a body after completely absorbing radio pharmaceuticals into body through intravenous injection and analyze the changes in body. Cancer is detected earlier through PET-CT because it is able to find biochemical changes the stage before producing structural changes. Early stages of cancer which is too difficult to detect can be diagnosed. 1-hour, one-time as the only test to diagnose cancer of whole body. Benign and malignant tumors can be differentiated. Safety check for the less radiation exposure. Check tissue function and metabolic status in body. Effective in controlling seroperitoneum and Increasing the survival rate of the peritoneum metastatic cancer patients. 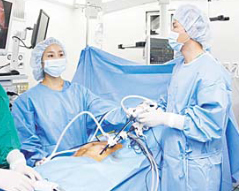 LHIPEC : Laparoscopic Hyperthermic Intraperitoneal ChemotherapyThe treatment is for the metastatic cancer inside the peritoneum. By using laparoscopy, the chemo agent is injected into the stomach and the temperature is kept to 42-43 degree for one hour. LHIPEC is done repeatedly for the first time in the world, and it is effective for reducing the metastatic node. The strength of the Laparoscopic Hyperthemic Intraperitoneal Chemotherapy. Prohibit the seroperitoneum producing by killing directly the metastatic cancer. The stomach and colon cancer patient who has the peritoneum metastasis, the survival length is getting longer. Metastatic cells! Both surgery and chemotherapy are in progress. Cytoreductive Surgery with Hyperthermic Intraperitoneal Chemoperfusion CRS + HIPECThis treatment is for peritoneal seeding cancer. CRS includes extensive excisions of organs and peritonectomy which are involved with tumor seeding nodules. HIPEC is a type of chemotherapy for peritoneal lesions. When this treatment is applied to a patient who has peritoneal metastasis and are left 6 to 9 months to live, the life is likely to be extended 1 to 2 years longer. This treatment can be applied to metastasis such as stomach cancer, colon cancer or ovarian cancer spread to internal organs in the abdominal cavity with shape of a grain of rice. Cancer Cells: Did you know that the cancer cells are destroyed at 13.56MHz wave? cancer or metastatic cancer and this treatment has no side effects. Almost no pain or side effects with less toxic. All areas including brain and bones can cure solid tumors. Expected synergistic effect with immunity. 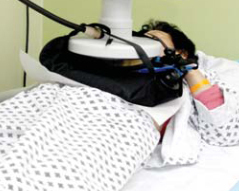 Improving treatment when combined radiation and chemotherapy. (Additional check or equipment is no necessary). CryoablationCryaosurgery is a process of necrosis of tumor by speed decrease of the core temperature to -80 while watching the screen with equipments such as CT or ultrasound. 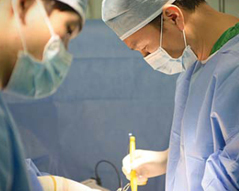 This is a procedure using minimally invasive method and patients can be discharged after 24 hours. Almost no scarring or pain. Effective on prostate cancer, kidney cancer, lung cancer, breast cancer and bone metastases. Analgesic effect to relieve pain. Cancer: Destroyed with Light not by a Knife! 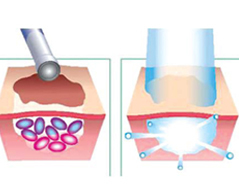 PDT Photodynamic TherapyPDT (Photodynamic therapy) is a selective destruction of cancer cells by lighting 630nm beam. No damage to normal cells. Effective on relapsed cancer stage 3, 4 as well as cancer stage 1,2. Applied to various parts of cancer such as gastrointestinal cancer. Esophageal cancer, bile duct cancer, lung cancer, bladder cancer, skin cancer, mesothelioma and cervical cancer. RFA Radio Frequency AblationA treatment is an ablation of tumor by high frequency electric currency after inserting a needle. This procedure is done while sleeping without anesthesia. Faster recovery after the treatment. High therapeutic effect applied in various parts. Broad range of application not only liver cancer, but also lung, kidney, bone and metastasis.